Vest sets are on fire these days and you'll see them on all the very best dressed stylish men who favor urban style fashion with a fast track appeal. 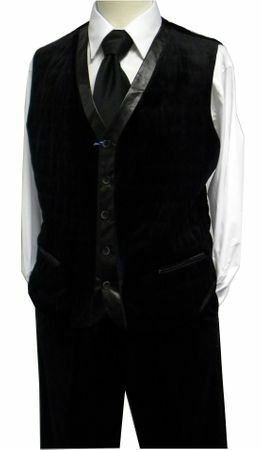 This Black Quilted Velvet vest outfit comes with a quilted velvet vest and solid black velvet flat front pants. The vest features leatherette trim as a stylish contrast to the velvet that will have you looking your best on a Friday or Saturday night.